Bethesda has one more day left in its 12 Days of Bethesda holiday event, but it’s not telling people what the final sweepstakes gift is. As part of the ongoing holiday event, Bethesda has been prompting its Twitter followers to retweet certain tweets and follow its various accounts to win prizes that could range from limited editions of games to full consoles. 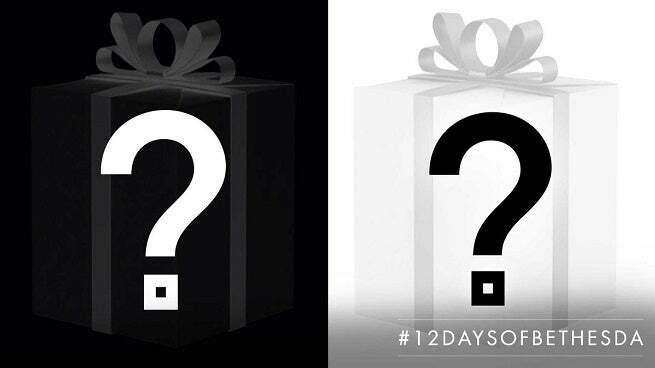 In a sort-of reveal on Monday, Bethesda is giving away a mystery gift with there apparently being two possible outcomes depending on what people say. Followers can either retweet the message and say “THIS” or “THAT” to determine which of the two gifts they get, but winners won’t know what the gift actually is until they’ve been selected. For today's #12DaysofBethesda let the holiday RAGE flow through you. #RAGE2, to be exact. Looking into Bethesda’s official rules for the sweepstakes doesn’t shed any more light into what the gift might be either seeing how the rules don’t include a list of prizes. The prize won’t exceed $500 in value, according to the rules, but if it’s the closing gift for Bethesda’s 12-day event, it’s bound to be one worth winning. The announcement of the mystery gifts follows similar sweepstakes opportunities from the past few days where followers were eligible to win custom consoles designed in the theme of Bethesda’s games. Fallout 76 and Wolfenstein II: The New Colossus are the two games the respective Xbox One X and Nintendo Switch consoles featured, but there’s only one of each to be won during the event. Other devices and prizes that Bethesda offered during the event included some Rage 2 controllers which can be seen below. Winners might wait a while for their prizes, but the official rules say all recipients should get their gifts by January 31st.